Background: Being discovered in bacterial genomes as regions with a high density of promoter–like sequences, promoter islands attracted attention due to an unusual combination of their functional features, specific structure and genomic location. Interacting with RNA polymerase, they form transcriptionally competent complexes, which, however, are mainly blocked at the stage of abortive synthesis of short oligonucleotides. Objective: Arrested transcription from promoter islands has an important biological significance, as most of them are associated with horizontally acquired genes, which in the course of adaptive evolution were subjected to specific silencing. Despite the strong evidences substantiating the genomic response to the integration of alien genes, we still do not have a clue on the molecular mechanisms underlying this adaptation. 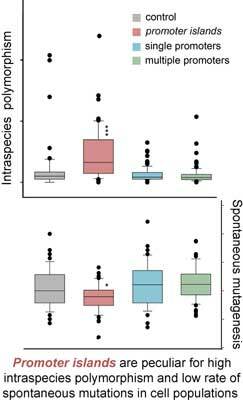 Results: Here we described those features of promoter islands, which had made them transcriptionally inactive, compared their intraspecies polymorphism with other promoters and non-promoter genomic regions, and evaluated the frequency and character of spontaneous mutations in their nucleotide sequences detected in bacterial populations during long-term growth. This analysis revealed several new a priori unexpected features of the islands. The most extraordinary of them was the observation that the frequency and the nature of spontaneous mutations in their sequences depended on the heterogeneity of the bacterial populations, and the number of point mutations in a more diverse community formed during long common growth was lower than in the culture derived from a single cell. Conclusion: Homeostasis of the islands may depend on intercellular communications within bacterial population. Keywords: Bacterial genomes, promoter islands, intraspecies polymorphism, horizontal gene transfer, spontaneous mutagenesis, evolution. Keywords:Bacterial genomes, promoter islands, intraspecies polymorphism, horizontal gene transfer, spontaneous mutagenesis, evolution. Abstract:Background: Being discovered in bacterial genomes as regions with a high density of promoter–like sequences, promoter islands attracted attention due to an unusual combination of their functional features, specific structure and genomic location. Interacting with RNA polymerase, they form transcriptionally competent complexes, which, however, are mainly blocked at the stage of abortive synthesis of short oligonucleotides.